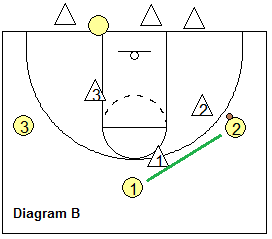 Use this drill to help teach the man-to-man concepts of on-ball defense, deny and help-side (See Basic Defense first). Also see the Shell Drill. See the diagrams below. Three offensive players are set up on the perimeter as in Diagram A. Defenders start from the three lines at the end-line. The coach ("C") passes to one of the three offensive players who stay put. 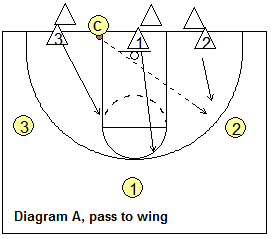 There is no scoring, passing, attacking in this drill. This drill simply emphasizes how the defenders should position themselves in a man-to-man defense. 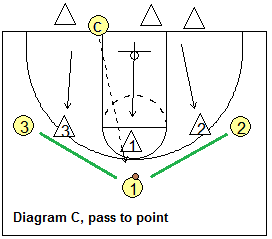 In Diagram A, the coach passed to O2, so the X2 defender makes a good close-out and plays "on-ball" defense. The X1 defender sprints out into a "deny" position (one pass away from the ball), and assumes a position a little up the line and a step or two toward the ball-handler (to prevent not only the pass, but dribble-penetration). The X3 defender sprints out to "help-side" defense, dropping down into the lane (two passes away from the ball). The coach makes any corrections in the players alignment, and then the ball is passed back to the coach for the next three defenders in line. The current defenders become offense and the offensive players go to the back of the defensive lines. 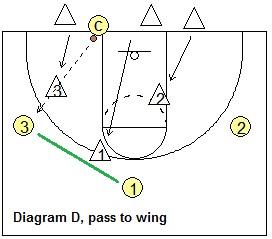 Note in Diagram C, the pass goes to the point, and the X1 defender sprints out and make a good "close-out", while the two wing defenders sprint out into "deny" defense. Diagram D is the same as Diagram A, only to the opposite wing. Coach Matt Painter at Purdue runs a similar, competitive 3-on-3 drill. After the perimeter players make several passes, coach yells out "Live" and the offense tries to score. with Jamie Dixon, University of Pittsburgh Head Coach. with Geno Auriemma, UConn Womens Head Coach.